The Browning Classic Camo Dog Collar is constructed with rugged polyester webbing, making this outdoors dog collar lightweight and durable for daily dog activities. A locking buckle provides a secure closure, ensuring this camo dog collar won't unfasten on its own. The reflective stitching features make this Browning Dog Collar perfect for use in low-light conditions. The Browning Classic Camo Dog Collar is constructed with rugged polyester webbing, making this outdoors dog collar lightweight and durable for daily dog activities. A locking buckle provides a secure closure, ensuring this camo dog collar won&apos;t unfasten on its own. The reflective stitching features make this Browning Dog Collar perfect for use in low-light conditions. With any dog accessory, it&apos;s important to have just the right fit. 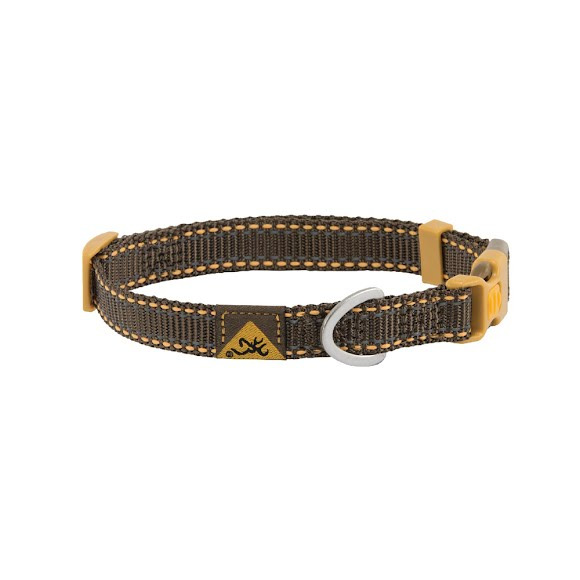 This Browning adjustable dog collar features fully adjustable straps for added versatility. Our camo dog collar comes in sizes small, medium and large. To find the right size, measure around the dog&apos;s neck and compare to the lengths listed. This genuine Browning dog collar is nothing short of The Best There Is with rugged webbing, antique nickel hardware, and premium outdoor style. Measurements Adjustable: 10" - 16"